Following a suddenly acquired desire to learn to fly, I started training for my PPL in early 2004. Two and half years in ‘real’ time and 47 hours 55 minutes in ‘air’ time later I took my GFT and, 2 hours and 30 minutes after that, was declared fit to be turned loose upon the unsuspecting sky. During this rather drawn out learning curve I’d been keeping an online diary of the process. I’d like to say this blog is a result of ‘popular demand’ that I continue but the truth is that I’m just having too much fun to shut up about it! A few weeks before getting the PPL (nothing like doing things in a sensible order) I bought a share in a Tomahawk based at Swansea, the lovely G-TOMS which I flew until November 2010 when she came to grief with another member of the group on the top of Pen y fan in poor weather/ The pilot was fine but the aircraft was a write off. Insurance was surprisingly quick and cooperative and those who continued with the group bought a Cherokee G-AWBG which we flew about a year until the maintenance costs got the better of us. After a period of hiring and further training I jumped ship to the ‘lighter side’ at the end of 2012, buying a third share in a microlight – X’Air Falcon G-CGOV, otherwise know as Rhubarb & Custard! With the costs trimmed right back I’m looking forward to lots more flying! Yes indeed – I like this machine! Firstly I would like to congratulate on getting your PPL and hope it brings you hours of pleasure in the future. The reason for this note however is to tell a little story that may be of interest to you and your collegues. My wife and I are both British but have lived in Mexcio City now for 13 years where we have a restaurant and catering business. We have just moved house and I was clearing through some old boxes in the loft the other day and happened upon my Pilot’s Log Book. Scanning the relatively few old entries it reminded me that my first solo flight, solo cross counrty and GFT were all taken in a Tomahawk at Guernsey Flying Club back in November and December 1980. I entered the Tomahawk registration in Google and what should come but your web pages. Yes it was G-TOMS and I am pleased ot see you, Alan, Andy and maybe some other colleagues are now the happy owners. So I thought I would write to let you know that probably long before you were all born I had some special experiences in your plane. I lived in Surrey at the time and had taken a few lessons at Biggin Hill but in the end I decided on an accelerated PPL course and went to Guernsey where I it took 26 days. During that time I spent a total of 28hours 25 mins in your plane, 10 of those solo. So I have very happy memories of the many circuits, my first solo, various flights over France, seeing boat races around St Malo, the stunning Mont St Michel, as well as my solo cross country landing in Nantes and Rennes, and finally the GFT. And all this in your very own G-TOMS. Unfortunately I am one of the statisical majority you mentioned who did not continue with flying although I did manage to get up in a 1942 Stearman here in Mexico for my 50th birthday! You say you want to do some over water flying so why not take G-TOMS home to where it began life in Guernsey as I’m pretty sure it was very new when I took the course. Also flying in France is a great experience. As a matter of interest I didn’t take any photos at the time but if you do have a spare one of G-TOMS it would be very much appreciated if you could email me one for my album if you don’t mind. Anyway, I hope you all continue with your flying and I’m sure you will have many happy memories of flying in G-TOMS. I’ve really enjoyed reading about your adventures. I’m based at Cardiff airport down the road..we should meet up one day..I’m fed up of all this solo flying. Sure, I’m always up for shared flying. Really good read, a fascinating approach to the whole learning to fly business. 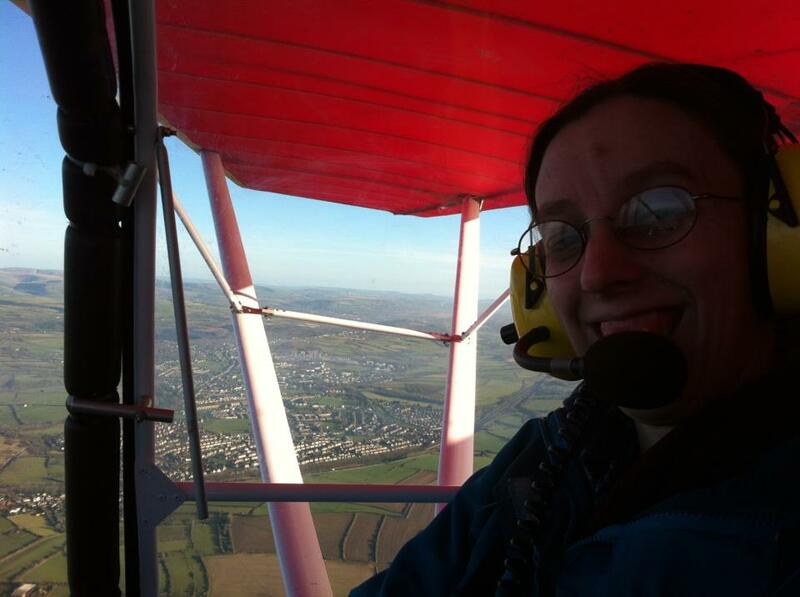 I’m about to take on my first lesson tomorrow down in Pembrey Airport (weather permitting of course…), would appreciate if you could maybe get in touch with me via e-mail – I think it would be invaluable to have someone to correspond with who has been through it all quite recently, if you would be willing. I too am on a budget so am looking at a lesson a month for the conceivable future, so I would be following very much in your footsteps.